Winnipeg, Manitoba has been called the "Gateway to the West," the "Heart of the Continent" and simply " One Great City," but we're known these days as a growing and thriving trimodal hub in the geographic centre of North America. That doesn't have quite the same ring as those other slogans, but it perfectly describes our city as the transportation powerhouse of the prairies. With our location at 49.8951° N, 97.1384° W (aka the heart of the continent) and proximity to international markets, you might think we’ve got a big head about all the bustling business we do here — but the fact is, our down to earth city (239 m / 784 feet above sea level!) is a powerhouse in every sense of the word (we offer some of the lowest aviation fuel taxes, diesel fuel and electricity rates in Canada too!). If you're looking for a place to grow your business, that should be more than enough to efficiently get your goods from A to Z.... and all of the M's, A's, O's and N's in between. The Hug Rug at the Winnipeg James Armstrong Richardson International Airport gets a lot of action these days (yes, we’re such a friendly bunch that our airport has a Hug Rug for emotional reunions), as it’s one of the busiest 24-hour airports in the country, offering flights to major cities across Canada, the U.S., the Caribbean and Mexico. The airport has seen an increase in passenger traffic for 16 straight months dating back to early 2016, clear proof of the growth Winnipeg has seen as a hot spot for business travellers and tourists alike. As well, Winnipeg's airport is a gateway to the north and the facilities, established air and ground links, fuel tax exemptions and manufacturing base also make it an ideal location to service international trade routes such as Europe. The airport is also home to major sorting facilities for FedEx, Purolator and Canada Post, receives daily transborder service from UPS and FedEx, and is a major centre for Cargojet Airlines. It's one of Canada’s most important airports for overnight all-cargo activity, and is the busiest freighter airport in Canada with 20+ scheduled freighters operating each day. As well, approximately 90 serviced acres with excellent transportation access are available for immediate development. Recently DHL, a world postal and logistics leader, announced an expansion of its service to Winnipeg. As of September 5, Winnipeg is connected to DHL’s hub in Cincinnati, Ohio, providing daily weekday service. And if you're flying into the city for a business meeting downtown, it's going to be a brisk 15 minute drive to our iconic Portage and Main intersection, home to the city's financial district with offices of leading Canadian banks on every corner. A CP train engine passes along the tracks at the CP Rail yards, a 110 hectare (280 acre) site in Winnipeg. Between the Canadian Pacific Railway (CP), the Canadian National Railway (CN) and the Burlington Northern Santa Fe Railroad (BNSF), Winnipeg's intermodal terminals are busy — combined, they handle over 5,500 cars per day and process more than 200,000 lifts per year, making the transporting of goods (like consumer electronics, books, DVDs… well, you get the idea) around North America happen with ease. 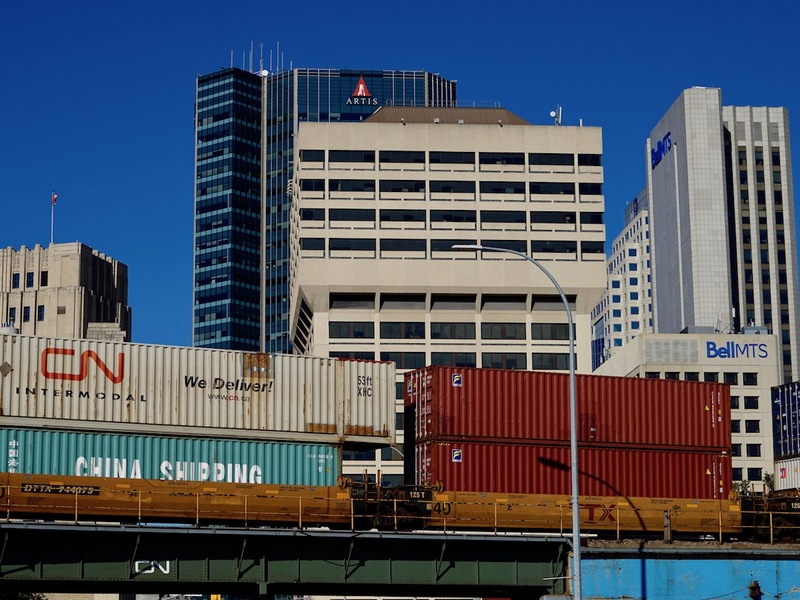 In fact, we're one of only two Canadian cities with three Class 1 railways and we’re the only major city between Thunder Bay and Vancouver with direct rail connections to the U.S.
Winnipeg is also home to two of Canada’s top 10 trucking firms, TransX and Bison Transport. Together, these two operators employ more than 4,000 workers, and operate about 2,900 tractors and 8,000 trailers. Collectively, with half a dozen other major trucking firms, over 1,000 for-hire rigs are based right here in Winnipeg, and that means aggressive pricing, great availability and first-rate service. Because it's situated at the heart of North America, Winnipeg is a core part of the mid-continent trade corridor — a multimodal geographic path and ribbon of economic influence that runs through the centre of the continent all the way from the Arctic to Mexico. One of Canada's busiest border crossings, in Emerson, Manitoba, is only an hour directly south of the city. When you base your business to the heart of the continent, you can be assured you'll get your products on schedule to anywhere in the world by plane, train and automobile.